A traditional toast made at Royal Navy mess dinners on Saturday nights has been updated to reflect cultural changes, the Ministry of Defence says. Naval officers will no longer raise their glasses to "Our wives and sweethearts" - typically met with the unofficial reply "May they never meet". Instead, they will say "Our families", following an instruction by the Second Sea Lord Vice-Admiral David Steel. 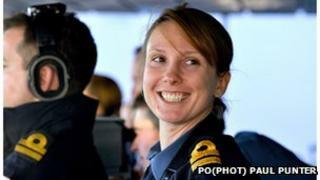 The MoD said it reflected that women have been at sea for over two decades. A second toast - made on Tuesday nights - has been changed from "Our men" to "Our sailors". Woman first served at sea in 1990, but it was only last year when the first woman was made commander of a frontline Royal Navy warship. By the end of this year it is expected that women will serve on submarines alongside men for the first time in the service's 110-year history. Monday - "Our ships at sea"
Tuesday - "Our men", now "Our sailors"
Wednesday - "Ourselves (as no-one else is likely to concern themselves with our welfare)"
Friday - "A willing foe and sea-room"
Saturday - "Our wives and sweethearts", now "Our families"
The navy has traditional toasts for every night of the week. However, it is understood such toasts are mainly made during large celebratory dinners or when a ship has anchored - not every day. On Sunday, officers might toast "absent friends, Monday is "Our ships at sea", Thursday is "A bloody war or a sickly season" and on Friday, glasses are raised to "A willing foe and sea-room". Wednesday's toast is "Ourselves (as no-one else is likely to concern themselves with our welfare)"
A spokesman for the Ministry of Defence said: "To reflect cultural changes and our modern and inclusive Navy, two of the naval toasts used at mess dinners have been updated. "The Royal Navy values the diversity and range of its personnel and it is only right that its traditional toasts should reflect the fact that women have been at sea for over 20 years."